A bustling harbour city, Oranjestad’s streets and shopping centres are dotted with international luxury retailers, diverse boutiques and dazzling jewellers. Fascinating restored landmark buildings are found along the way, such as the green “stadhuis” housing and the City Hall where civil marriages are performed. A scenic linear park lines the coast from Oranjestad to the airport. A new state-of-the-art tram begins at the cruise terminal, meandering through town, all along the sparkling new landscaped Main Street. Oranjestad is also a jumping nightlife mecca, filled with restaurants, cafés, clubs, lounges, bars and casinos. Fort Zoutman, Aruba’s oldest building dating back to 1798, was built to protect the city from pirates. The Willem III Tower was built in 1868, once a lighthouse and public clock tower. The Historical Museum located between the two buildings houses a permanent exhibition outlining the main events in Aruban history and changing themed exhibitions. Stay in town for the Bon Bini Festival on Tuesdays at 6:30 pm in the outdoor courtyard. Enjoy the island’s history, traditionally-costumed folkloric dancers, local music, culinary specialities and local art. 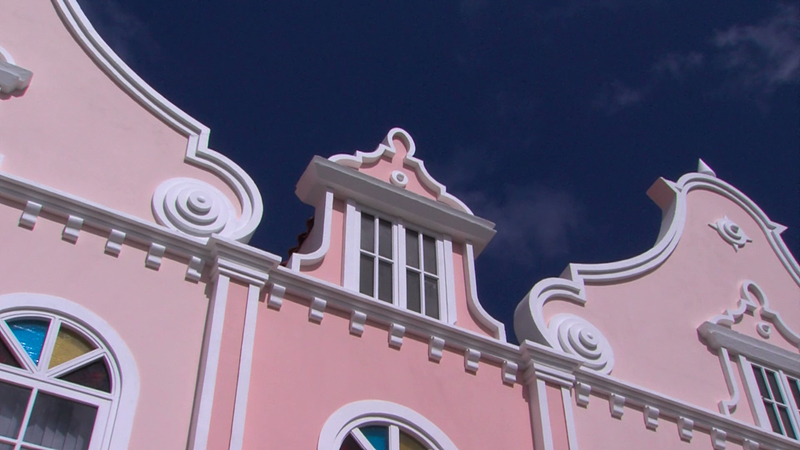 The historic Ecury family home in Oranjestad has been transformed to house the Archaeological Museum, an impressive modern museum that strikingly presents Aruba’s Amerindian cultural heritage and archaeological finds. Inspiring monuments honouring political leaders Jan Hendrik Albert (Henny) Eman, Cornelis Albert (Shon A. Eman and Betico Croes) are found near the Parliament building. The statue of Queen Wilhelmina of the Netherlands stands in a park carrying her name. World War II heroes Boy Ecury and the National Guard and volunteers are also honoured. The Aruban economy was once dependent upon aloe. The Aloe Museum and Factory, located at the Hato Plantation outside of town that dates back to 1890, tells the fascinating story. Getting around Oranjestad has never been easier or more fun, with the addition of a state-of-the-art tram, inaugurated in 2012. Connecting the cruise ship terminal with the town centre, the tram passes through the Main Street, now completely remodelled and an attractive pedestrian precinct. The tram makes six stops at monuments and museums along the way, as well as at key shopping areas. In 2015 Oranjestad welcomed the new cultural/historical project Paardenbaai Aruba, which features eight blue horses that are strategically placed in different locations around the town centre. Our capital of Oranjestad Aruba holds historical evidence of our resilient past and is developing rapidly towards a prosperous future. There are so many things to do in Oranjestad, from cultural activities to shopping and dining. Feel free to explore the city centre by tram to get to know the shopping areas. You will find some great Oranjestad restaurants near the tram lines, too. If you’re staying at one of the Oranjestad Resorts, you are in a perfect location to enjoy everything Aruba has to offer. From beautiful beaches to exciting cuisine and fun activities for the entire family! Staying at one of the Oranjestad hotels or holiday rentals is a great idea!